Features side drop handles. Ideal for planters, storage and dcor. Weather resistant, rodent resistant and won't absorb odors. Features side drop handles. 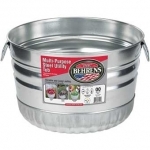 Ideal for planters, storage & dcor. Weather resistant, rodent resistant and won't absorb odors. 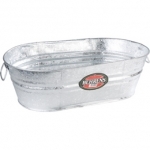 1 bushel galvanized round basket. Features side drop handles. 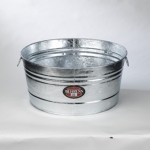 Ideal for planters, storage and decor. Weather resistant, rodent resistant and won't absorb odors. Molded from the finest corded rubber on the market, mothing matches the pliability and strength of DuraFlex Rubber. It is crush-proof, crack-proof and freeze-proof so you can leave it outside year-round! Ideal for feeding smaller animals. Has capacity markings.